Tata Motors is one of the largest automobile manufacturers in India and they have several vehicles in its portfolio. Among those, Tata Venture is one of the lesser expensive models that comes with a 1.4-litre diesel engine as standard under the hood. It is capable of producing 70bhp along with a maximum torque of 135Nm. The car maker is offering it in numerous variants among which, Tata Venture GX 7 Str Captain Seats is the fully loaded variant. This trim is packed with several important features like a dual AC unit with roof mounted air con vents, a music system, digital information system and storage boxes. At the same time, it is integrated with crucial safety features including front fog lamps, engine immobilizer and impact protection beams, which safeguards the vehicle and its passengers as well. This vehicle is integrated with an advanced drive easy technology that minimizes the clutch efforts and provides smooth gear shifting. At the same time, it is also loaded with stability technology that reduces the loss of traction and maintains high speed stability at cornering. This vehicle is available in a total of eight different color shades like Ivory White, Arctic White, Champagne Gold, School Yellow, Meteor Silver, Glossy Black, Blazing Red and Castle Grey. This utility vehicle has a boxy design yet it looks trendy owing to its neatly crafted cosmetics. Its side profile is absolutely stylish as it gets sliding second row doors and glossy C pillars. It also has conventional features like body colored door handles and ORVM caps. Its wheel arches are neatly carved and have been fitted with a set of 14-inch steel wheels . These rims have stylized wheel caps and are covered with a set of tubeless radial tyres of size 165 R 14 LT 8 PR. Its rear profile has a dazzling look owing to its taillight cluster featuring turn indicator, courtesy lamp and brake light. Its D pillars also houses reflectors, which further provides additional safety. The tailgate is quite large that houses a wide windscreen along with a wiper. It is further decorated with a chrome inserts in the form of badges and a horizontally positioned strip. Its front profile has a bit of outdated look but its neatly carved cosmetic gives it a classy appeal. The headlight cluster is slightly bigger and it is powered by conventional halogen lamps and turn indicators. The radiator grille in the center is fitted with a chrome plated strip along with company's insignia. The front bumper is quite small, but it houses an air dam, which provides better air intake for engine. In addition to these, there are a pair of fog lamps, which improves the visibility a head. The Tata Venture GX 7 Str Captain Seats trim has a huge internal cabin that can accommodate at least seven passengers. Its cockpit and the second row comes fitted with captain seats, which have reclining facility. These captain seats have excellent thigh and back support and are covered with good quality fabric upholstery . This trim comes with an injection molded interior trim that is further decorated with fabric inserts. The dashboard is neatly designed and is equipped with a glove box, AC unit and a digital information system. On the other hand, this vehicle comes with ample luggage storage space that can be extended further, thanks to the flat folding third row seats. The car maker has installed several utility based features inside like front sun visors with passenger's side vanity mirror, tachometer, mobile charger and cigarette lighter. The main highlight of the interiors is its excellent leg and head room as it comes with a large wheelbase of 2100mm along with a height of 1878mm. This trim is powered by a 1.4-litre, IDI diesel engine that complies with Bharat Stage IV emission norms. It is based on DOHC valve configuration with 4-cylinders and 16-valves . It is further integrated with an intercooler and a turbocharger, which helps the motor to unleash a maximum power of 70bhp at 4500rpm that results in producing a peak torque output of 135Nm at just 2500rpm. The car maker has paired this motor with an advanced 5-speed manual transmission gearbox, which is further integrated with Drive Easy technology for smooth shifting of gears. This vehicle has the ability to produce a maximum mileage of 15.42 Kmpl (on highways) and delivers 11.5 Kmpl (on city roads). This utility vehicle is bestowed with vacuum assisted independent hydraulic braking system featuring front disc and rear drum brakes, which delivers excellent performance irrespective of weather conditions . As far as the suspension is concerned, its front axle is paired with independent strut suspension in combination with an anti roll bar. While the rear axle is equipped with multi link system that is loaded with coil springs. This mechanism is assisted by a stability technology, which keeps the vehicle agile and keeps the traction during uphill driving. It is also incorporated with a highly responsive power steering system that supports a minimum turning radius of just 4.5 meters. 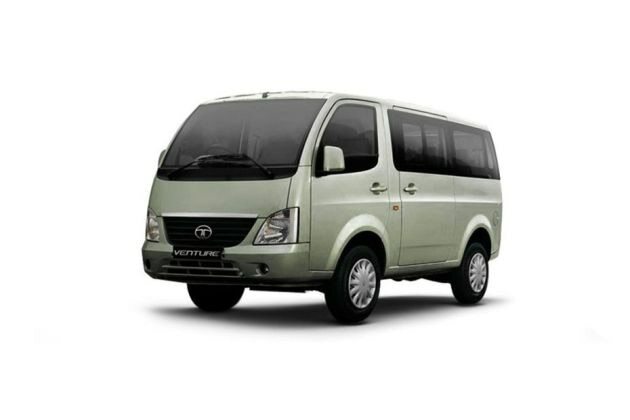 This Tata venture GX 7 Str Captain Seats trim is the top end variant in its series, which is available with an array of features. The most important aspect is its dual AC unit featuring roof mounted air con vents. It also has a music system including four speakers that keeps the occupants entertained while traveling. In addition to these, this trim has a list of features including two glove boxes, cigarette lighter, mobile charger, a digital information system, tachometer, digital clock, retractable inner grab handles, roof lamps and butterfly type 3-speed front wipers. Apart from these, it has flat folding third row seats, key less entry, rear demister and front power windows. This utility vehicle is bestowed with crucial safety features, which safeguards the vehicle and its occupants. It has a list of features including an engine immobilizer, front fog lamps, reverse guide system, front crash reinforcement and high mount stop lamp. It is also integrated with child lock, collapsible steering and side impact protection beams. 1. An ideal vehicle for bigger families. 2. Engine performance is quite good. 1. Fuel economy can be made better. 2. There is still scope to improve its interiors and exteriors.